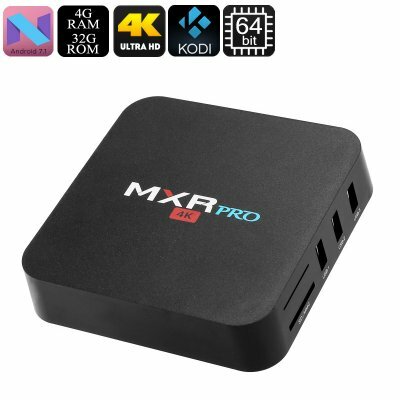 Successfully Added MXR Pro Android TV Box - 4K Support, Quad-Core CPU, 4GB RAM, Android 7.1, Google Play, Kodi, Bluetooth, WiFi, 64GB SD Card Slot to your Shopping Cart. The MXR Pro Android TV Box belongs to the newest generation of Android media players. With its powerful hardware, it lets you enjoy the latest and most demanding media from your TV. It runs on an Android 7.1 operating system meaning that a smooth user experience is guaranteed. With access to Google Play and Kodi 17.3, this Android TV box allows you to easily download and install millions of the latest Apps, games, and movies. With this Android TV box at your side, you’ll be able to entertain all your friends and family with amazing upcoming movie and gaming nights. Within its body, this Android 7.1 TV box packs a Quad-Core CPU that has been clocked at 2.0GHz. This processor is capable of putting forth a powerful yet energy-efficient performance. Along with a whopping 4GB RAM and 32GB internal memory, the MXR Pro handles anything you throw at it. For those of you that want to take the most out of your media experience, the TV box comes with a 64GB SD card slot. This provides you with plenty of storage to keep all your films and games. It is guaranteed that, with this Android TV box, you’ll never have to feel bored again. 4K support lets you enjoy your favorite movies and sports in breathtaking resolutions. This 4K TV box treats you to stunning visuals. Vivid color and extreme details let you enjoy your films and series like never before. With its WiFi support, you can download and stream media straight onto your big screen TV. This stunning 4K TV box turns any regular TV into a full-blown Android smart TV. This Android media player comes with a 12 months warranty, brought to you by the leader in electronic devices as well as wholesale Android TV Boxes..